You know Altoids, right? Those amazingly strong little mints in the tin can? Perhaps you are making your own fresh-breath replacement mints with this Homemade Altoid Mint recipe? Or, perhaps you’re like so many and have stash of leftover Altoid tins taking up space in the garage? Well, if you’ve ever wondered what to do with all those tins, here’s a clever way to charge your phone or device! Lightweight, compact and ready to capture the sun’s energy. 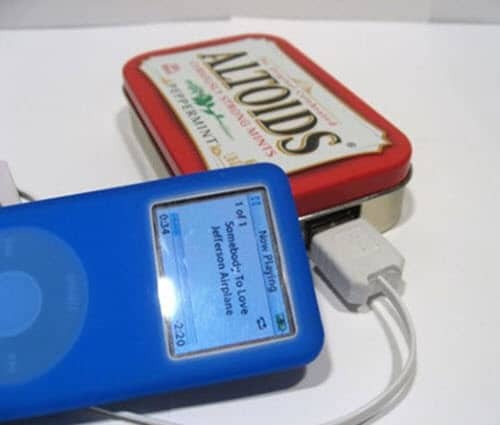 This DIY solar Altoids USB charger can come in handy when you are out camping or hiking. Many store-bought USB chargers run around about $60, so you’ll save money too by making your own. And, of course, you can make a few inexpensive USB chargers for friends and family. This little project makes a nice and practical gift.